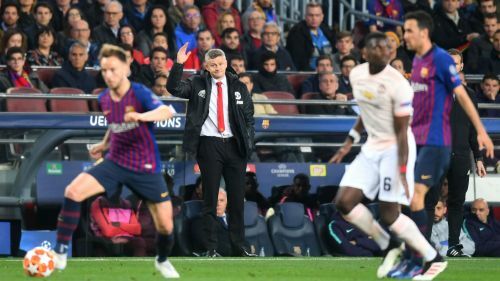 Manchester United crashed out of the Champions League in Barcelona on Tuesday, with a 3-0 defeat at Camp Nou ensuring they matched a losing streak that last occurred 20 years ago when Ole Gunnar Solskjaer was on the pitch. A first-half double for Lionel Messi and Philippe Coutinho's glorious strike after the interval ensured Barca cruised into the last four with a 4-0 aggregate success. United have now lost four successive away matches in all competitions for the first time since October 1999. Current manager Solskjaer featured in each of those games as a player. Solskjaer's side also succumbed to United's heaviest aggregate defeat in a two-legged European tie, while the Red Devils have now been eliminated from the Champions League quarter-final stage on seven occasions - more than any other side. Overall, despite a memorable comeback against Paris Saint-Germain in the last 16, United's campaign has been a frustrating one, with five defeats throughout the tournament marking their joint-most in a single season, level with 1996-97.